I have long been interested in the practice of meditation and mindfulness, but I long considered it rather arcane and mystical as I feel it is generally seen in the Western world. 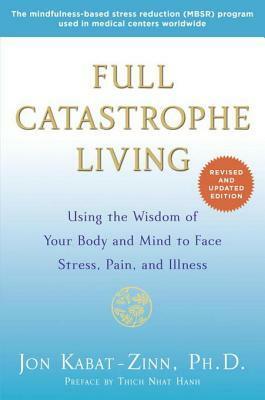 This book was recommended to me rather casually in one of my last sessions with a Cognitive-Behavioral therapist I was seeing in Cambridge at the end of a chain of referrals, that began about GI issues, but ultimately was seen as some variety of depression and/or anxiety conditions. No offense meant to that therapist’s service, but I suspect the book recommendation may ultimately prove more useful than our sessions together. It’s a good book. I am not done with it, but I am confident in this assertion. It is delightfully secular, having come out of a program at the University of Massachusetts Medical center, but still, I believe, captures the spirit of mindfulness well. The author, John Kabat-Zinn, holds a Ph.D. in molecular biology from MIT, and his voice comes across as a scientist, as well as a medical and zen practitioner. And lest you think the book is outdated, this new edition (which I have) was published late in 2013. What I have read of the book, I have found reassuring and enlightening, even as I make slow progress – I find when reading about intentional awareness, one tends to feel like rereading. The book lays out an 8 week ‘Mindfulness Based Stress Reduction’ curriculum cultivating a regular formal mindfulness practice. I went at it for a little over a month, but eneded up hovering somewhere between week 2 and 3. I’ve kinda fallen out of practice and may start over :-/. I look forward to continuing this journey, and think I will have more thoughts to share on the matters soon. There exists an organization called Freelancers Union set up to offer group benefits and (some semblance of) collective bargaining for freelancers and entrepreneurs in New York. Part of the greater organization is called Freelancers Medical (or “Collective Primary Care”, depending where you look). While a fully functioning Primary Care practice, co-pay free and exclusive for members of Freelancers Insurance, they also offer many free, weekly classes in many things including yoga and meditation. These are open to anyone who signs up for Freelancers Union (a free, simple web form). I live near the Brooklyn location of Freelancers Medical and have been attending one or the other of the meditation classes there most weeks. They are led by a woman named Jennifer Fuller who before moving to NYC studied at Naropa University. The longer sitting practice is enhanced, I think, by being around others practicing also. At the very least you feel less silly just sitting there. When undertaking a timed sitting practice, I make use of an app called Insight Timer on my phone that has a lot of nice recordings of various singing bowls, as well as doing some tracking of frequency of practice. As noted, my pace through Full Catastrophe Living has been slow, but when I finish it I think I plan to look into Mindfulness in Plain English and Zen Mind, Beginner’s Mind. The text of both are freely available online at these links.